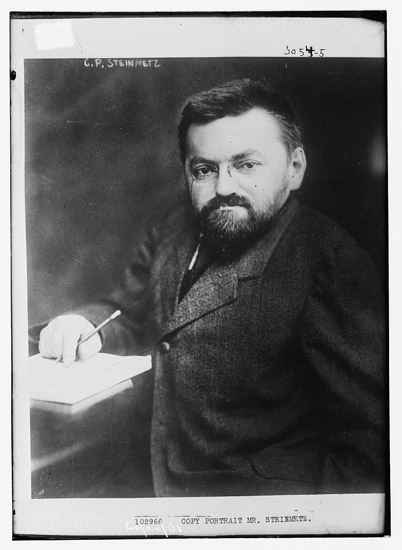 In 1888 on Ellis Island, exactly one hundred years before I was born, Charles Steinmetz, a German engineer was nearly turned away by immigration officials. The reason? Simply because he was a dwarf, measuring four feet in height. But a friend convinced the officials that Charles was a genius who would eventually be of great service to America. Fortunately, he was given the chance and did not disappoint. Before long, scientists and engineers were traveling all over just to meet with him. Not long after, Henry Ford was having some trouble at his plant. His engineers couldn’t solve the problem so he called Charles Steinmetz. When Steinmetz arrived, he declined any assistance and asked only for a cot to sleep on and notebook to write in. For days and nights, he studied the generator and took notes. At the end of the second day, he climbed up on a ladder and made a mark on the side of the generator with a piece of chalk. He explained to the engineers that they needed to replace sixteen windings from the field coil behind the plate. When they did, the generator hummed along perfectly. Henry Ford was very pleased until he got the bill. It was for $10,000. Making chalk mark on generator: $1. Knowing where to make mark: $9,999. The time to do the work of making the mark did not represent the value of the solution that was provided. Sure, Steinmetz worked for two days, studying the problem, but it was his expertise acquired over years that enabled him to solve it in so short a time. Hourly billing is an arbitrary metric. When you bill by the hour, you’re merely guessing at and approximating the value of the solution you’re providing to your client. When you get better or become more efficient in your problem-solving skills you’re left, once again, approximating that value by arbitrarily inflating your hourly rate. The problem with hourly billing is it positions you as an expense to your client. When there is an emphasis on a rate, you open yourself up to comparison. Can someone else do the job cheaper? Do they have a lower rate than you? Value-Based Pricing always starts with the client. You’re not trying to exploit the client for your own gains, you’re starting with generating value for them. This is why many projects must be turned down. If there’s no value to the client, it is your duty to decline the project. No value, no project. If Value-Based Pricing was exploitative, we would be attempting to get money from the client no matter what—regardless of whether there was value to them in completing the project. Nothing we do as professionals exists in isolation for our clients. Professionals consider context—they think about everything outside and around the project they’re working on. They work to solve the right problems. In order to know what the right problems are, you have to learn the context around the project. It’s the professional’s responsibility to determine if the project will even be viable in the first place. A project should only ever be taken on if you can create value for your client. How do you know if the project will produce value for the client? You have to discover that. You have to enter into discussion with them. This is a time-consuming process and it takes extra work, but this is what is required if you want to learn to price on value. I have a guide for you called 7 Value-Discovering Questions to Ask Your Client that you can get by entering your email in the purple box below and subscribing. The guide walks you through different questions to use to help ensure your next client project will create real value for your client. Once you learn to uncover the value your work will create, you can use that to anchor your pricing. A value-based price is only ever a fraction of the return the client will get on your work. This is why the amount you charge is always a no-brainer to the client when you learn to position it effectively. If you didn’t know, I have an entire course dedicated to Value-Based Pricing. Wednesday, November 11th, on the live webinar, we will be opening up registration for the Value-Based Pricing Pilot Program for just a few days. Those who are subscribed will also receive a mini series of videos that teaches you how to price on value and an invite to the live webinar we’re doing to show you how to determine value to clients who don’t see an actual monetary return.